Excited to work in an urban farm and eager to master the skills of a self-sufficient smallholder, Silvja joined VGI only recently, after an extensive experience with Agri-financing in her home country, Albania. Silvja’s favorite vegetable is eggplant and favorite food eggplant lasagna. 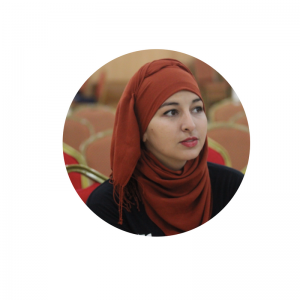 As a team leader for AIESEC Benak in Algeria, Rokia Khadidja Kalouache has experience developing and promoting awareness of environmental issues through trainings for youth. Upon returning to Algeria, Rokia plans to build an urban-farm, healthy lifestyles startup, and share new methods of eco-agriculture with the public. Rokia is placed here in Victory Garden Initiative working on an urban-farm to learn how to engage a community in farming and how to shift from household gardening to farming.